Established in 1998, Ace Tree Services are a family run firm of tree surgeons. We are trusted for our excellent service, affordable prices and the high standards of our skills and workmanship. We pride ourselves on providing the correct tree surgery or tree care procedures for your needs. our qualified tree surgeons will advise you the best options for your trees that will give you the knowledge to make informed decisions. Based in Kibworth, just outside of Market Harborough. 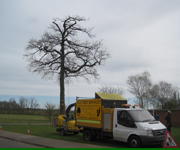 We offer a full range of tree services to both domestic and commercial clients within the whole of Leicestershire whilst still being local and affordable tree surgeons. Ace Tree Services is built on the principles of providing a reliable service and making the customer happy. Our aim is to offer you a top quality service using the best experience available. We take on work of any size without losing care and attention that is required by all jobs. A few examples of tree work we have undertaken over the many years, proving we can tackle any sized job in any location. Examples can be viewed at our Tree Gallery Page. 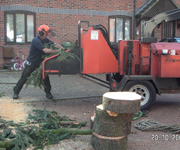 Ace Tree Services are fully NPTC qualified and insured. This means customers can trust us to get the job done safely and effectively.